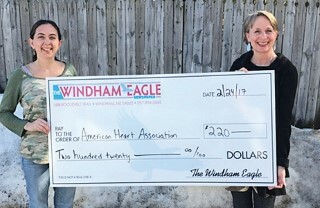 As a result of American Heart Month, celebrated in February, The Windham Eagle organized an advertising campaign in the February 24, 2016 issue to raise funds for the American Heart Association. For every ad sold, $5 was donated to the organization. A total of $220 was raised and given to the Maine office in Scarborough. The American Heart Association is the nation’s oldest and largest voluntary organization dedicated to fighting heart disease and stroke. Founded by six cardiologists in 1924, the organization now includes more than 22.5 million volunteers and supporters. The monies donated are used toward funding innovative research, fight for stronger public health policies, and provide critical tools and information to save and improve lives. If you missed these pages, visit our website at www.thewindhameagle.com/online/2017/20170224/#/TheWindhamEagle/0 to see the flip book with 44 supporting advertisers. A big thank you to our local advertisers for making this wonderful contribution possible and please remember to always support your local small business.